I went to the ROM yesterday, and had a fairly good time. My photos are on my aunt's camera, so you'll get them in tomorrow's post. They put on a new wing, and it looks good, but messes with perception, even inside. What I was most impressed with was the gift shop: it used to be a dingy little afterthought with everything either too expensive or things you could get for kids. Now, they have all sorts of things, including reproductions. 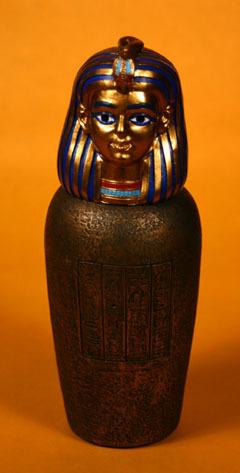 I got the four canopic jars. Why did I get them? 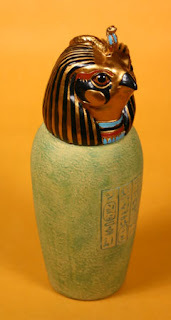 Well, I'm a visual person, and the four sons of Horus (the canopic jars) are used in making an Egyptian circle, which is a ritual I'm going to share with you today. I found this in a book called Egyptian Paganism for Beginners, which I reviewed here, but was modified a bit by me. Any basic Wiccan circle can be modified to fit any tradition or theme you want. - If you are a visual person like me, you can get a set of the four canopic jars, and place the corresponding deity in each direction, to give a more visual boundary to your circle. The shrine or altar should preferably be placed in the east, the direction of sunrise, or else so that you are facing toward Egypt. This might be hard to do if you have a permanent altar set-up. You may wish to have a copy of this ritual printed out with you while performing the ritual, in order to make sure you are following all the steps. It is also a good idea to do a couple “run-throughs” of the ritual, to get a basic feel for the ritual. In that way, you can also modify it to fit your own tastes before the actual ritual begins. Light the candles or tea candles at the four quarters, but leave the candles on the altar unlit when you start. Face the altar and compose yourself. Relax. Visualise a white light shining down from above. It comes from a divine source and bathes you and the room in its cleansing power, removing all unwanted influences from the vicinity. Image the divine light entering through the top of your head and flowing down your spine, awakening the latent psychic-etheric energy that is in your spine (like Chakras). A force also rises up your body form the earth. Imagine these forces within your body, imbuing you with power. Take up your wand or use your finger, and turning clockwise, face east. Point your wand or finger toward the east and visualize the power flowing out toward where you point. Moving clockwise, draw the circle around your working area, from east to south, to west, to north, to east. As you draw it, visualize it as a line of bluish-white light flowing from the tip of your wand or finger, emanating from the power circling in your spine. Take your time to do this, pausing at each quarter is necessary—you may need to allow power to gather before you continue. When you have completed the circle, see it as a line round the circumference of a great protective sphere that encompasses you and your place of working, creating a sacred space within it. Alw ays turning clockwise, take the sistrum, face east, and shake it. Sat: “Hail to you, Lords and Ladies of the East, Powers of Air! Hail, Lord Qubhsennuf! Please be present at this sacred place and witness this rite.” You need to project the words out onto the astral plane or realm of the imagination. The sound does not have to be loud in actuality, but it should be imagined as long enough to call the elemental air to you. As you chant the name three or four times, visualize Lord Qebhsennuf approaching in the form of a falcon—a golden bird of prey. He comes to rest at the edge of the circle as a tall, falcon-headed man, and behind him you can see a sunny sky with windswept clouds. You may “hear” clairaudiently a greeting from the neter. Reply politely, thanking him for coming (you may reply with your “inner voice” rather than speaking aloud). Turn south, shake the sistrum. Say: “Hail to you, Lord and Ladies of the South, Powers of Fire! Hail, Lord Duamutef! Please be present at this sacred place and witness this rite.” Visualize him as a black jackal—a slim, doglike animal resembling a greyhound with erect, pointed ears and a bushy tail—approaching through a desert landscape. He comes to rest at the edge of the circle as a jackal-headed man (or woman as this neter is sometimes female), seen against a background of flames. If he greets you, thank him for coming. Carry out a similar procedure in the west, calling on the power of water and Lord Imsety. See him as a bearded man standing on the seashore with the waved behind him. Repeat the procedure in the north, but this time calling on the powers of earth and Lord Hapi. Visualize the neter approaching in the form of a baboon or ape. He stands at the edge of the circle as a baboon-headed man, seen against a background of plants and trees. These four guardian spirits are the Four sons of Horus. As he cometh forth from the horizon. If performing the ceremony at night, you may wish to replace Ra with the name of a moon god such as Thoth or Khonsu. And it destoryeth the powers of Set according to the decree. Thus, the circle is ready for work. Be sure that if you invoke a deity, you should thank them at the end of the rite. Go round the circle counter-clockwise, stating in the east and pausing at each quarter to thank the respective elemental powers and neter. For example, in the east, shake the sistrum and say: “Lords and Ladies of the East, powers of Air, and Lord Qebhsennuf, thank you for attending this rite. Hail and farewell!” Visualize the neter departing, taking the elementals with him and the door to the elemental world closes. Extinguish the candle or tea candle as this happens. Use the energy to send a word or blessing to the elementals. Othewise, send a healing thought to those in need—candles in this rite should not be blown out unless they are used in this way. If you do not send a blessing, snuff out the candles on the altar. This is so cool! Thanks for posting this. I'll try this out the next time I cast!